A couple weeks ago I picked up a sofa from a local picker. It looked amazing but it had a huge whole in the seat cushion and some of the piping was coming loose. It was in such a great color that it was a shame that it needed to be reupholstered. 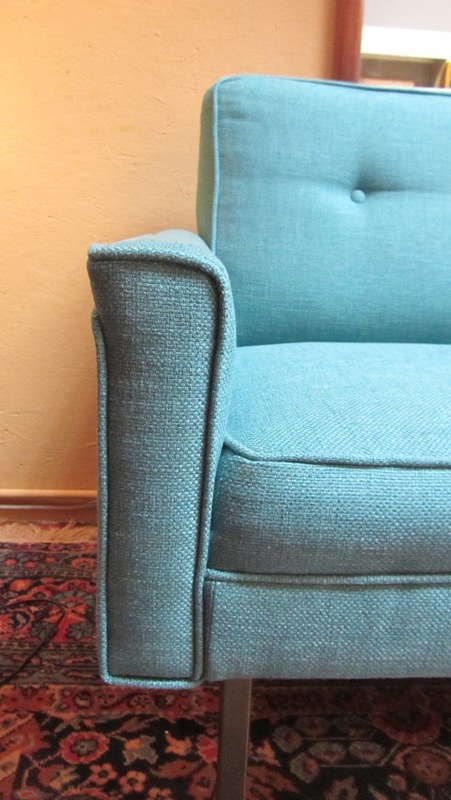 We had been wanting to reupholster a sofa in aqua blue for a while and this seemed like a great opportunity to do so. Unfortunately we did not take any process photos so here is the final result. Sold at Hawthorne Vintage. Dimensiosns: 78'' wide x 29'' deep x 33'' tall. Here is a quick pic of all of our other current offerings. I have been looking for a couch JUST like this. Too bad I don't live closer. Thanks Melissa! I'm a sewist, I love to sew quilts and clothes. When Chris started picking, he got a few pieces that needed upholstery. I slowly started to try it out. I learned from starting with small projects and increasing from there. There really isn't much online that was too helpful. I really learned from vintage upholstery books from the 60s and 70s. I've thought about a tutorial, but it really isn't something that a simple tutorial could teach. Each piece you encounter new and interesting challenges and obstacles. I'll keep it in mind though. I know that an amazing new book is coming out this fall that will be the new bible in upholstery. It's written by the gals from Spruce Upholstery in Austin, Texas. I'll be sure to blog about it when it comes out!